You've probably seen our gorgeous Steampunk Airship kits on our Facebook Page and our website but did you know how easy they are to assemble? The sky is the limit (yes, pun intended) when working with this fabulous kit. 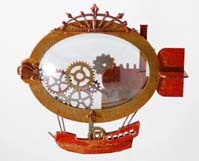 Right now, we're running a special on our Steampunk Airship kits - just $4.99 each! And they are shipping now. You can paint, ink, mist, or treat the pieces with our new Enamel Powders before assembling or after assembling! It's all up to you how you choose to create with our versatile kits. Did you know we have YouTube videos detailing the assembly of most of our products? We want to make sure you have all the resources you might need to help you get creative and decorate your home with Globecraft Memories. Check out the rest of our videos on our YouTube channel. Card Decor is for MORE Than Cards!